Snohomish County adopts rainwater collection for potable usage for single family residence. In September 2015, we published a post recommending that both Snohomish and Pierce Counties adopt rainwater collection for residential potable usage. The necessity for adoption was presented considering a 30% reduction in water availability was predicted in the next 35 years. The Seattle Times reported about the Hirst Decision and its effects in rural development in many counties throughout Washington. These counties should follow the lead of counties before them by providing a sustainable, viable water rights decision on single family residences that allows for potable rainwater systems. It is the only fair decision to be made. We congratulate Snohomish County for having a progressive approach to water conservation. Adding to our list of firsts, this week, we will install the first potable residential system in Wahkiakum County upon their acceptance of a RainBank Rainwater Systems design. RainBank Rainwater Systems has been Designing and installing Rainwater collection for residential potable usage for over 16 years. We will continue to promote, advise, and educate rainwater collection as a viable, sustainable water source in all counties in Washington State. 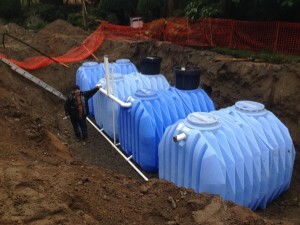 We look forward to helping those in Snohomish County achieve water rights for potable usage using rainwater collection. 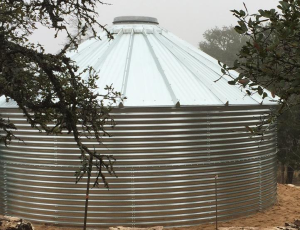 At the beginning stages of planning a rainwater system, be sure to choose a system designer / installer who will work with you to design and build the most effective and efficient system for your needs. You especially want a company that knows how to navigate the complex permitting process. Here is some information we originally published last year, which, if you are new to our blog, can be helpful as you plan your own system. RainBank Rainwater Systems is a full-service rainwater systems contracting company offering design, permitting and construction throughout Washington State and surrounding areas. RainBank’s rainwater systems are custom designed to meet the expectations and needs of our customers. Whether commercial or residential, potable or non-potable, RainBank works closely with architects, designers, builders, and individual homeowners who appreciate face to face consultations and flexible / scalable solutions. Rainwater collection is appropriate for small scale residential needs and large scale commercial applications. 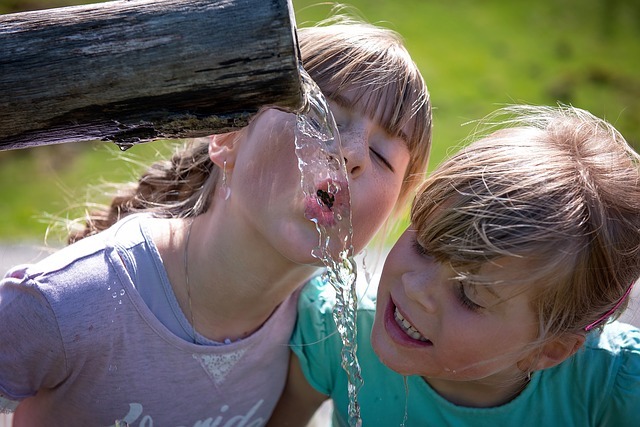 Rainwater collection can help mitigate stormwater runoff, while providing a viable water source for irrigation, wash down, toilet and laundry facilities. With proper design rainwater collection can supplement city water usage for both residential and commercial demands. If properly filtered and disinfected rainwater can provide whole house potable usage in many Washington State counties. Rainwater collection and use can be integrated into a drainage plan to meet the new 2016 storm water codes. Permitting can be complex and sometimes frustrating, especially when the rules change. RainBank Rainwater Systems meets all requirements of permitting and engineering for our customers from city, county, and state agencies. We stay up to date on changing codes and permitting requirements, taking the guesswork out of the process. RainBank designs and assembles customized kits and plans for the do-it-yourselfers. Providing detailed designs and components with support from our engineering department. 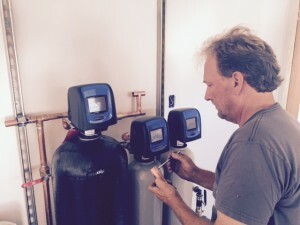 All onsite management and installation are by ARCSA accredited installers and licensed plumbers. RainBank offers turnkey solutions and we guarantee our work. We specify and order all materials and components, delivered to your location and install, finalize and test your system. We only specify and install the most reliable components that meet our experience of over fifteen years installing systems. We train our customers on how to maintain their systems so they become their own purveyor of water. Labor Day, the first Monday in September, is a creation of the labor movement and is dedicated to the social and economic achievements of the American worker. It constitutes a yearly national tribute to the contributions workers have made to the strength, prosperity, and well-being of our country. 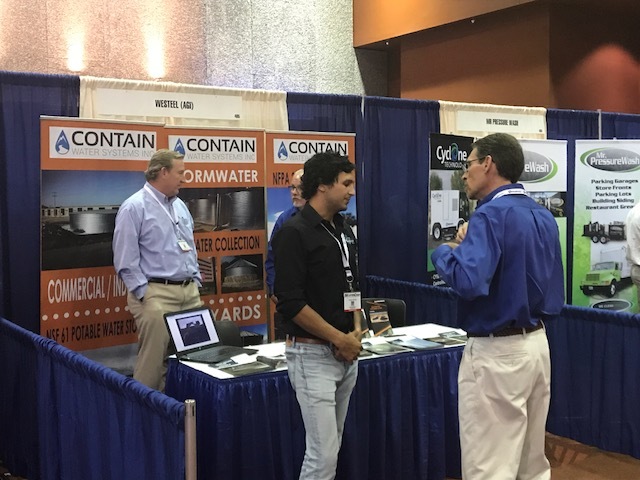 RainBank Rainwater Systems’ Chad Lindsly is seen in the photo at left, at the 2017 Stormwater Conference in Seattle, where he is explaining the benefits of collecting rainwater for beneficial usage, while mitigating stormwater. RainBank Rainwater Systems would like to take a moment to recognize the combined dedication of our employees, along with members of the American Rainwater Catchment Systems Association (ARCSA), in the advancement of stormwater management and rainwater collection. The efforts of these dedicated individuals in bringing education and awareness of the effects of stormwater runoff and the benefits of collection before it becomes runoff should not go unnoticed.